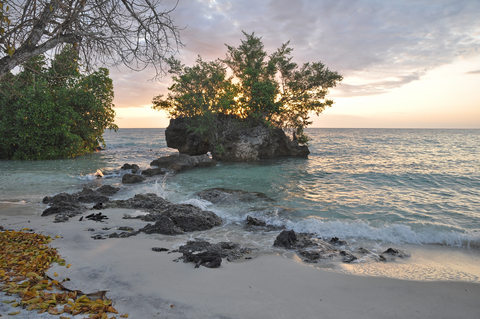 Coastal East Africa stretches for 2,900 miles from northern Kenya through Tanzania and Mozambique. There are few places on Earth that can match the vibrancy and diversity of life found here. The region boasts a variety of landscapes, including mangrove forests, sea grass beds, coral reefs, and a multitude of island archipelagos. These ecosystems support an abundance of plant and animal life. 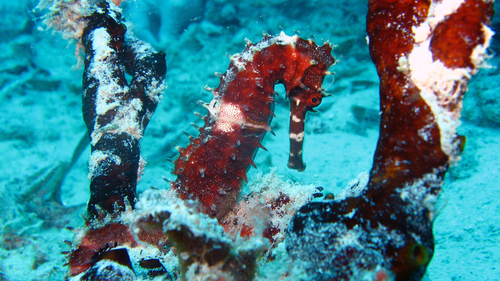 More specifically, the coastal waters of East Africa sustain a great variety of ecologically important species, including 350 species of fish and 40 classes of corals, 5 species of sea turtles, and 35 species of marine mammals, including whales, dolphins, and the endangered dugong. 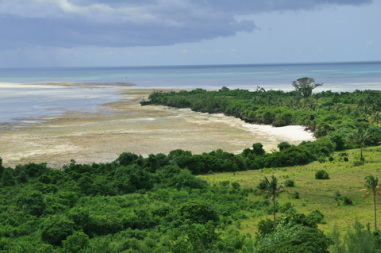 According to WWF, the East African coastline (northern Kenya through Tanzania and Mozambique) harbors about 64.3 million acres of the coastal forests (including mangroves), slightly larger than the state of Oregon. In total, mangroves and other marine ecosystems constitute 192 million acres of coastal East Africa, almost twice the size of the state of California. 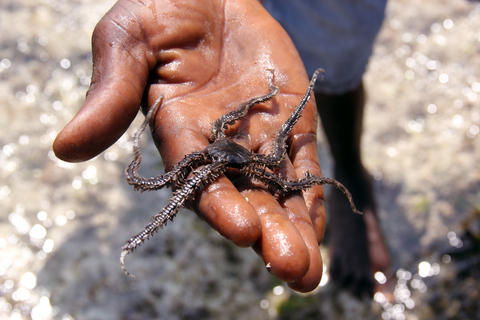 The coastal communities of Eastern Africa--over 30 million in population--have a strong cultural heritage with rich traditions, and their livelihoods and health are directly connected to natural resources. It is for this reason that East Africa's coastal region boasts an enormously vibrant culture, hosting multiple UNESCO world heritage sites throughout the region. 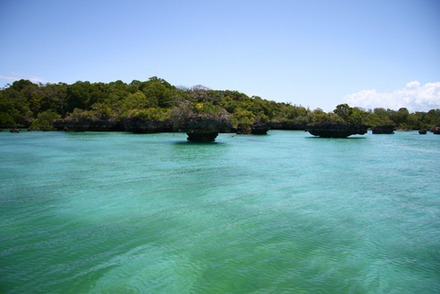 View of coastal forests and rock islands from the ocean, Kenya. NOTE: Copyright for this video belongs to the copyright owners. The views contained within this video do not necessarily represent the views of Kaskazi Environmental Alliance unless explicitly stated otherwise. 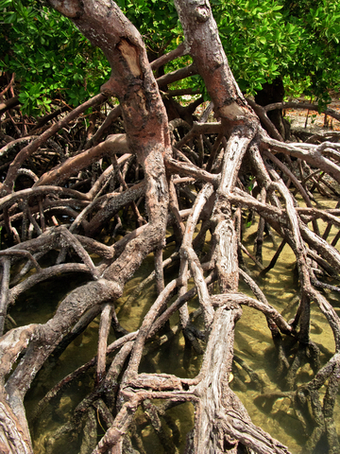 Mangrove forests literally live in two worlds at once. Growing in the intertidal areas and estuary mouths between land and sea, mangroves are comprised of salt-tolerant trees and other plant species from a range of plant families. They thrive in intertidal zones of sheltered tropical shores, islands, and estuaries. Mangroves have specially adapted aerial and salt-filtering roots and salt-excreting leaves which enable them to occupy the saline wetlands where other plant life cannot survive. 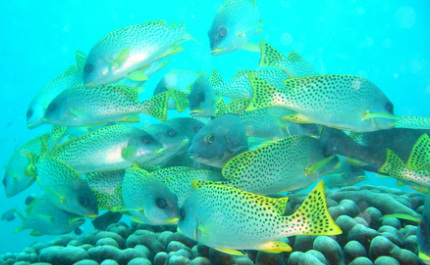 Seventy-five percent of all tropical commercial fish species pass part of their lives in the mangroves, which provide them with nursery grounds, shelter, and food. East African mangroves support the greatest flora and fauna diversity of all African mangroves, as well as providing support for critical habitats such as coral reefs. 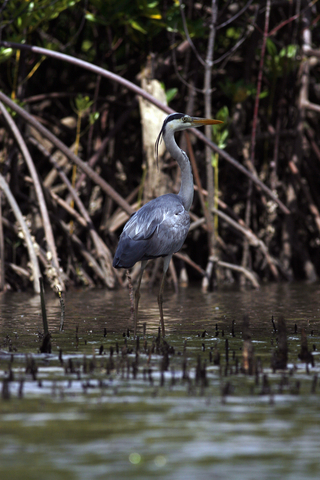 Besides the many fish and invertebrates that find refuge, breeding grounds, and nurseries in mangroves, many migratory bird populations rely on the delta and wetlands as stopover and wintering habitat. 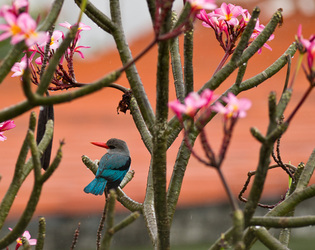 Local residents include the Mangrove Kingfisher (Halycyon senegaloides), migrants such as the Greater Sand Plover (Charadrius leschenaultii), and Grey Plover (Pluvialis squatarola). Any threats to the mangroves, then, endanger the entire ecosystem. Mangroves’ protective buffer zones help shield coastlines from storms and wave action, minimizing damage to property and losses of life from hurricanes and storms. 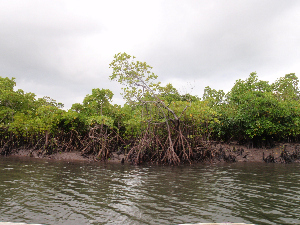 The stability that mangroves provide is essential for preventing shoreline erosion. By acting as buffers that catch materials washed downstream, they help stabilize land elevation by sediment accretion, thereby balancing sediment loss. In regions where these coastal fringe forests have been cleared, tremendous problems of erosion and siltation have arisen. 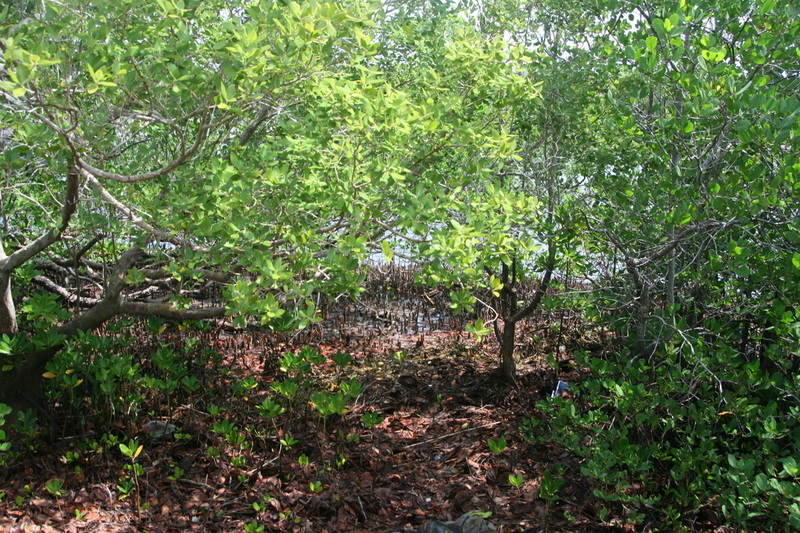 Mangroves are important, too, in treating effluent resulting from storms, because the plants absorb excess nitrates and phosphates, thereby preventing contamination of near-shore waters. 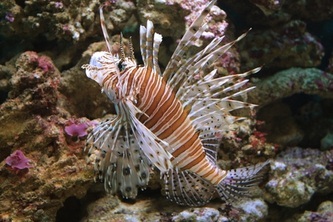 Moreover, they absorb carbon dioxide and store carbon in their sediments, thus lessening the impact of global warming. 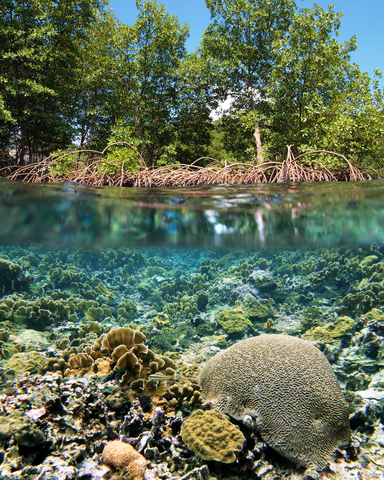 Mangroves also offer protection for associated marine ecosystems, such as sea-grass beds and coral reefs, that depend on healthy mangroves to filter sediments and provide nursery grounds for resident species. 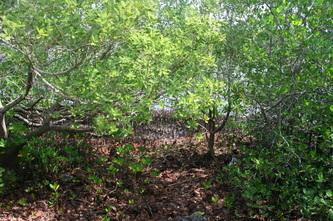 Mangroves absorb carbon dioxide and store carbon in their sediments, therefore lessening the impact of global warming. According to new studies, mangroves may be the world's most carbon-rich forests, storing up to 50 times more carbon than tropical forests by area. Also, sea-grass beds and coral reefs depend on healthy mangroves to filter sediments and provide nursery grounds for resident species. Traditional and indigenous coastal populations have depended on mangroves for centuries, collecting products and resources for hundreds or even thousands of years, including construction materials, firewood, medicines, tannin, fibers and dyes, food, and charcoal. Coral reefs depend on underwater mangrove roots to cleanse/filter water. 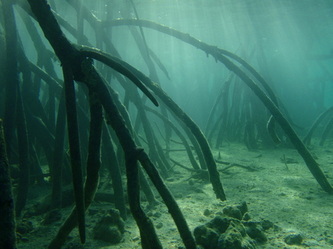 Ecosystem surrounding underwater mangrove roots. 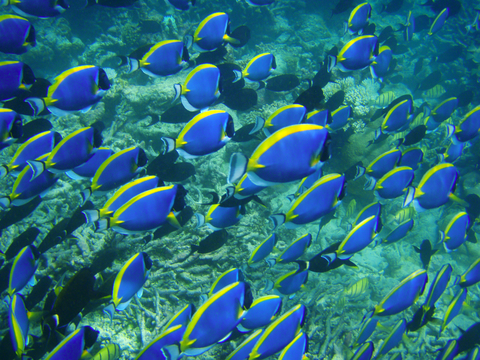 Reefs are home to one quarter of the ocean’s biodiversity even though they only cover a tiny percentage of the ocean floor. 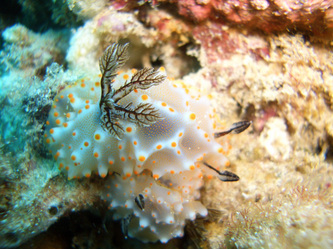 Nealy 1500 species of reef-building coral, coraline algae, and other sedentary animal species make up their infrastructure. 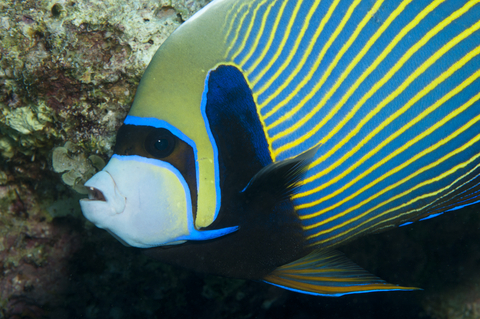 The reef itself is actually a component of a larger ecosystem. The coral community comprises a system that includes a collection of biological communities, representing one of the most diverse ecosystems in the world. 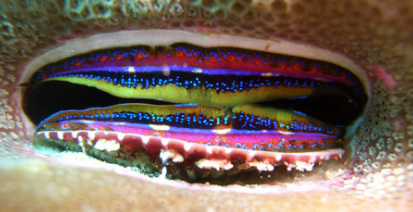 For this reason, coral reefs often are referred to as the "rainforests of the oceans." 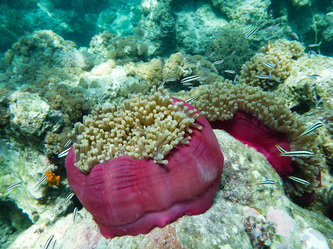 In a sense, coral reefs represent a microcosm of the ocean at large. 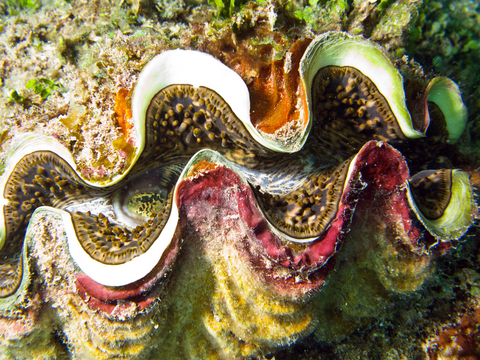 Like the ocean, reefs have immense economic value for local communities who depend indirectly on them for eco-tourism and directly for the fish that swim in or around reefs. East Africa's coastal communities have had a long association with reefs. They are important fishery and nursery areas and, more recently, have proved to be very important economically as tourist attractions. 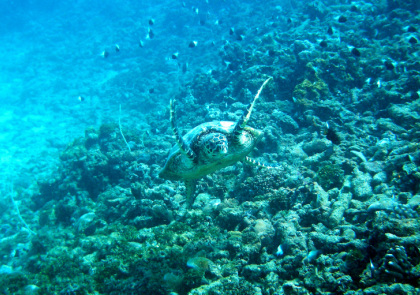 Reefs also provide protection from erosion to coastlines and sand for beaches. Recently, however, reefs located near coastal populations are showing increasing signs of stress. Coral reefs and their associated ecosystems of sea grasses, mangroves, and mudflats are sensitive indicators of water quality and the ecological integrity of the ecosystem. 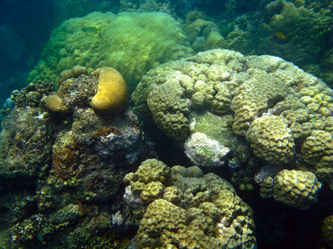 Coral reefs tolerate relatively narrow ranges of temperature, salinity, water clarity, and other chemical and water quality characteristics. Therefore, they are excellent sentinels for the quality of their environment. 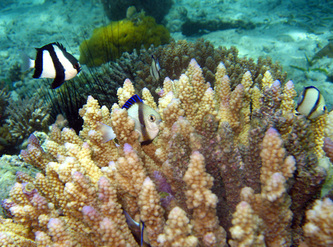 Proper monitoring of reefs can identify changes in water quality or impacts from land-based activities. Monitoring changes in water quality can help local resource managers understand the implications of actions occurring in watersheds that are associated with particular coral communities. KEA's marine science education program engages students in a water quality monitoring program which will provide long-term data on water quality impacts from land-based activities. 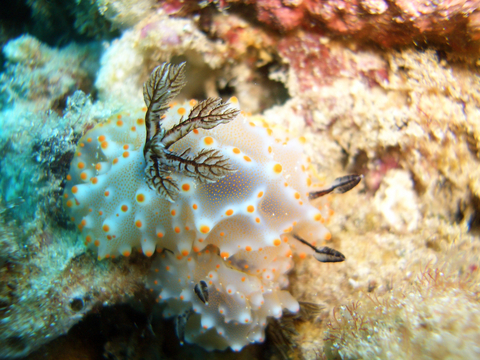 These connections will help in development of sound management plans for coral reefs and other coastal and marine resources. 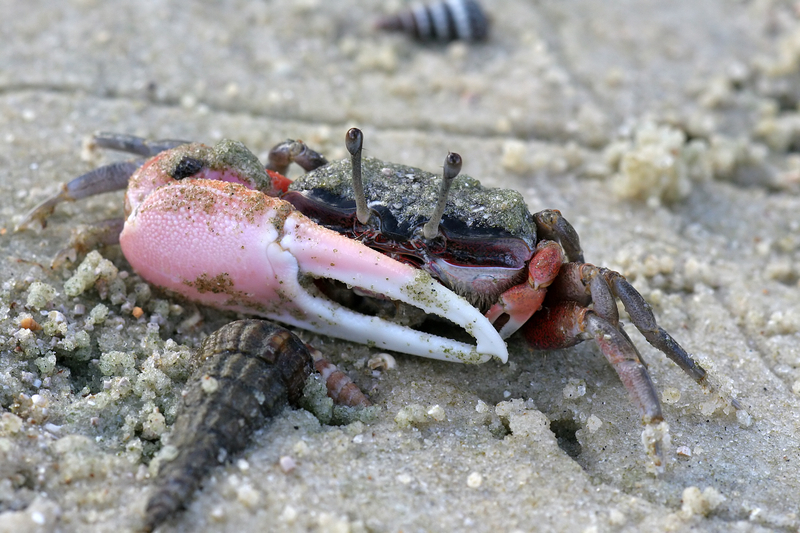 Sandy beaches, rocky shores, tide pools, and coastal mud flats of coastal East Africa provide feeding and breeding areas for multitudes of fish, invertebrates, and about 35 species of resident and migratory seabirds. Between October and March each year, hundreds of thousands of shorebirds fly from their breeding grounds in northern Europe to feed on the mud flats of the large mangrove estuaries of Lamu in Kenya, and the Rufiji River in Tanzania. Sea grass beds are the only true flowering plants found in the sea and are among the most productive areas of the world. 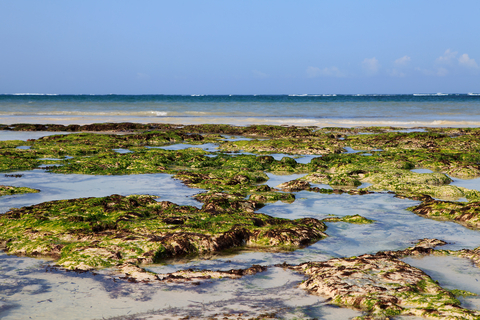 Sea grasses form extensive beds on the mud and sand of coastal East Africa. 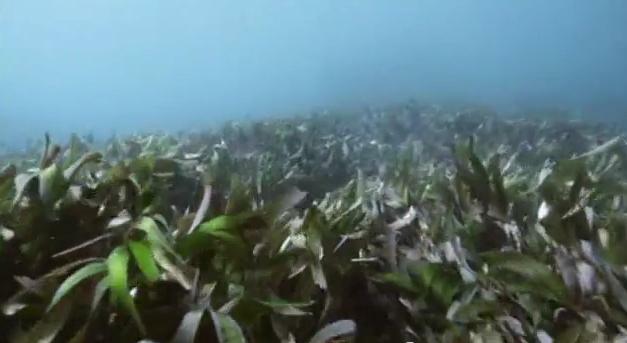 Twelve species of sea-grass beds are found in East Africa, the dominant one being Thallasondendron ciliatum, which forms monospecific stands. 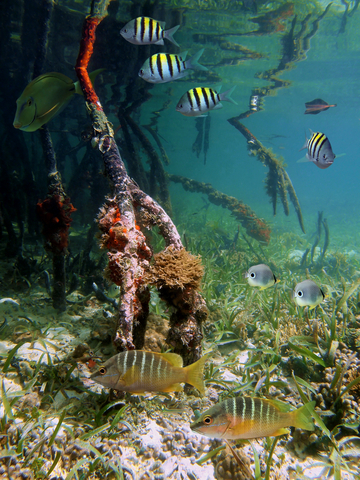 Its structure provides a home beneath its canopy for juvenile fish and invertebrates, making sea grass beds important habitats for many coral reef species. 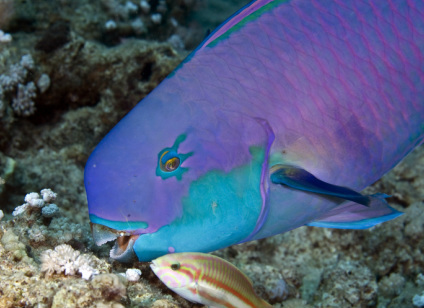 Sea grasses also form important foraging grounds for endangered species such as dugongs and marine turtles as well as for important fish species like the rabbitfish, surgeonfish, and parrotfish. 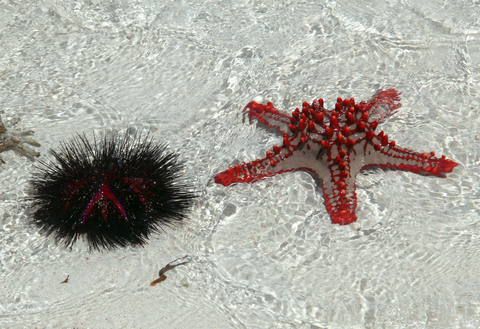 They are home to thousands of small species of animals and plants, including seaweeds, sponges, worms, crabs, shrimps, marine snails, starfish, sea cucumbers, and sea urchins. People collect popular shells and sea cucumbers from sea grass areas, as well. Sea grass beds provide food and shelter for an array of marine life. 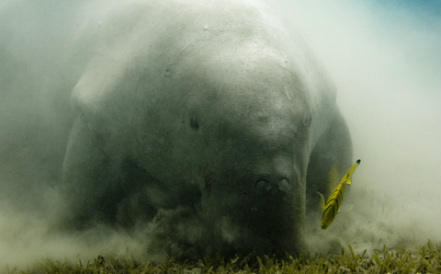 Dugong feeding on sea grass beds. Marine mammals most common in East Africa are sirenia (dugongs), whales, and dolphins. 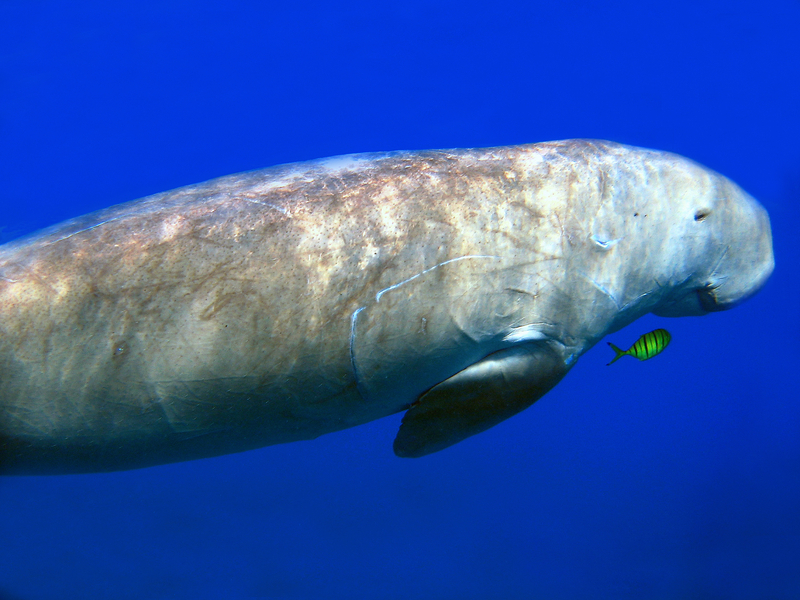 Dugongs are large grey mammals which spend their entire lives in the sea. 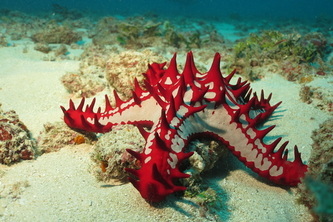 Fully grown, they may be 3m long and weigh 400kg. They have a thick layer of fat, giving them a distinctly rotund posture, small paddle-like flippers positioned far forward on the body, and a broad, flattened, powerful tail that resembles the tail of a whale. They have nostrils near the top of their snouts. Dugongs live in warm, shallow waters and sheltered bays and lagoons less than 5m (16f) deep. They feed primarily on sea grasses. For this reason, they are sometimes called "sea cows." In Kenya, large dugong herds were reported frequently before the 1960s. According to World Wildlife Federation (WWF) 2004 data, the exact numbers of dugong in Kenya are not known; however, a small number of dugongs has been spotted in the Lamu Archipelago (northern Kenya). 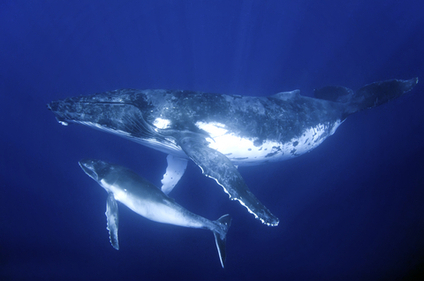 In addition to dugongs, East Africa's marine environment hosts a variety of whales. Common species of whales include, for example, sperm whale, humpback whale, Bryde’s whale (Balaenoptera edeni), minke whale (B. acutorostrata), killer whale (Orcinus orca), and melon-headed whale. East Africa is also home to an array of dolphin and porpoise types. Common species of dolphins include the bottlenose dolphin (Tursiops sp. ), common dolphin (Delphinus sp. ), humpback dolphin (Sousa chinensis), spinner dolphin, spotted dolphin, Fraser’s dolphin, Risso’s dolphin, and the striped dolphin (Stenella coeruleoalba). In addition, various species of shark and their relatives, including skates, and rays--collectively referred to as chondrichthyan fishes--have been recorded in the East African coastal waters. 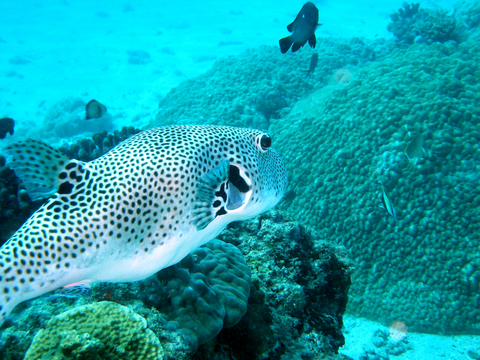 The most frequently noted shark species are bull sharks, tiger sharks, and whale sharks (known locally as “papa shillingi” in Kiswahili). 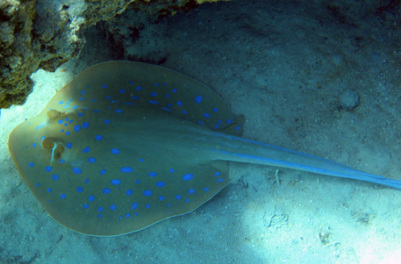 A variety of ray species are also found in East African waters. 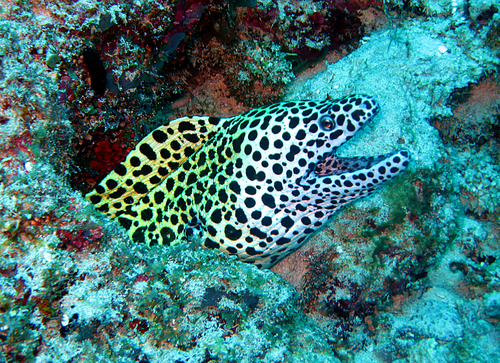 One is the Ribbontailed Stingray, an attractive marine aquarium trade fish popular because of its small size and brilliant color pattern. The extensive catching of this and other coral reef species has let to widespread destruction of reef habitats. 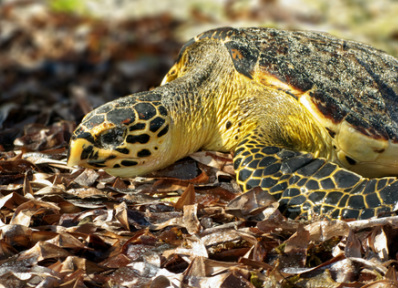 Sea turtles have a complex life-cycle, with eggs laid and hatched on beaches, post hatchlings being pelagic (open ocean), sub-adults residing in developmental habitats, and adults living in adult-foraging grounds. At different times in their lives, most species migrate between different foraging grounds, which are often hundreds of miles apart, and they migrate from these foraging grounds to offshore nesting beaches during the reproductive season. 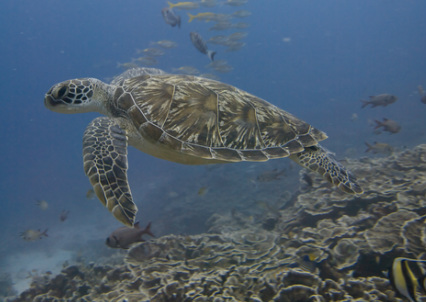 Five of the world’s seven species of sea turtles are found in the Kenyan ocean waters: the Green (Chelonia mydas), Hawksbill (Eretmochelys imbricata), Loggerhead (Caretta caretta), Olive Ridley (Ledpidochelys olivacea), and Leatherback (Dermochelys coriacea) turtles. 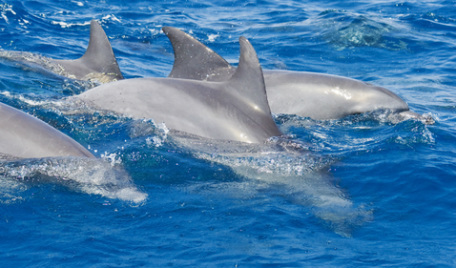 Dophins in open ocean, Zanzibar. Unfortunately, what nature managed to preserve, mankind has increasingly endangered. Currently, East Africa coastal/marine resources are seriously threatened by human activities, notably the rapidly growing economies and populations in this region. These are driving massive changes in the landscape, such as forest clearance and agricultural intensification, causing increased sedimentation and pollution from agricultural chemicals. Massive urban expansion has also led to serious pollution problems close to urban centers. 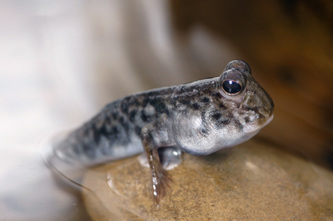 Fishing pressures are ubiquitous, with chronic over-fishing for both local consumption and export, the highest rate of blast fishing (fishing with explosives) in the world, and over-fishing of target species even in remote parts of the region—all of which are leading to endemic species extinction. Further, mangrove trees that once lined the East African coastlines are being destroyed for commercial use at an alarming rate. Mangroves occupy the largest area of coastal habitats, growing along the outer rim of the coastline to form a narrow fringe between land and sea, stabilizing the shoreline. 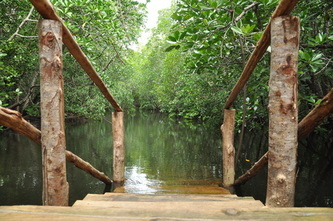 Mangrove forests are one of the most productive and bio-diverse wetlands on earth. 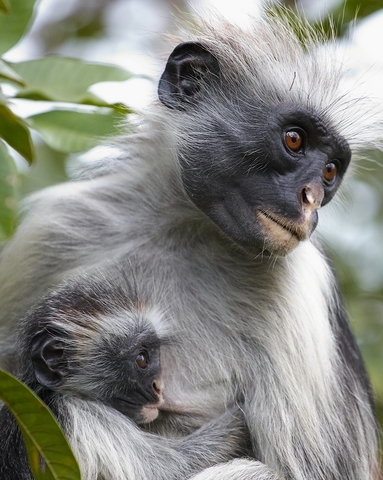 Yet, these exceptional coastal tropical forests, among the most threatened habitats in the world, are disappearing more quickly than inland tropical rainforests. 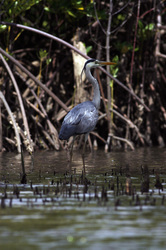 When exposed at low tide, the mangrove forests teem with crabs, worms, and snails, many of which are food for birds. At high tide, mangrove forests attract hundreds of species of fish, crabs, and shrimps, which depend on the forests as feeding areas and nursery grounds for their young. The destruction of mangrove forests has been devastating, making implementing conservation and management vital. KEA is working to conserve these important habitats and thousands of unique species in Coastal East Africa so that the people who live here will be able to sustain their livelihoods and lift themselves out of extreme poverty.